This unit is on the ground floor and you can walk right out the lanai onto the sand!! Flooring has been upgraded with modern plank tile throughout. The renovated kitchen has granite countertops and modern appliances including refrigerator, glass top range/oven, dishwasher and microwave. The kitchen is fully equipped including a range of small appliances and Kuerig coffeemaker. The dining area has seating for six (including two bar stools) and is right off the kitchen. The living room has a couch and loveseat, large flat panel HDTV and an amazing view out to the lanai and the Gulf. The air-conditioned lanai has sliders looking out to the Gulf of Mexico and the beach. This unit also has glass sliders between the living room and Lanai giving the option of closing it off so the inside is air-conditioned but sliders can be opened on the Lanai. It is furnished with chairs and table to let you get comfortable as close to the water as possible. The owners have equipped this unit with lots of extras including beach chairs, beach umbrella, boogie boards/skim boards, kids surfboard, beach toys, bucket ball, a beach cart, and more! It also has a Wii Game Console with games, board games (for kids and adults) and a bunch of family movies on DVD. Sleep at night with the ocean surf right outside your window! The master bedroom has a bay window overlooking the Gulf and beach below. It has a king-size bed, large HDTV, walk-in closet, and en suite bathroom with a tiled tub/shower combo. Note: Rates based on occupancy of 2 - additional occupants $70/week up to max occupancy. We have travelled to beach locations all over the world. 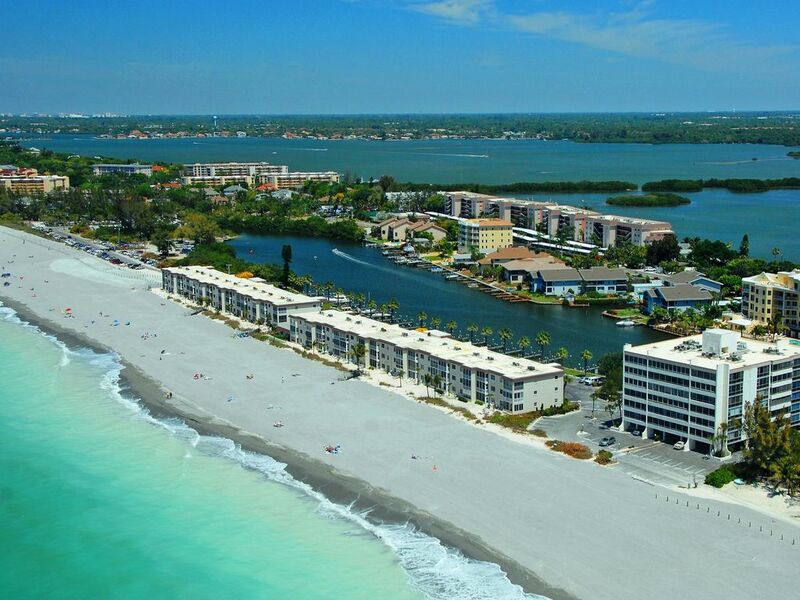 We fell in love with Siesta Key and purchased our first vacation home there in 2001. Just completed our 4th year. This is the place that gets us through the winter! Condo is just perfect for the two of us but there are provisions for more if you need it. . Kitchen well equipped. Every type of beach equipment is also provided. The building is within walking distance of kayak and boat rentals, restaurants and a free trolley to the Village. Every year the owner makes little improvements. Already signed up for next year. Thank you for your review and thank you for returning each year. We appreciate you! Why we had a GREAT vacation! We can not say enough about how much we enjoyed our stay in this beautiful unit provided by Russ and Dina. It was so nice to have the basic necessities already stocked in the kitchen when we arrived. I am including the bottle of adult beverage as a necessity :) ! Having beach towels, chairs, a cooler and a cart were great. So nice to know that these are things that we will not have to worry about packing/bringing next year! My husband loved being able to walk out the door and straight to the beach to start fishing! Already looking forward to next year! Thanks for taking the time to leave a review. We appreciate it! We look forward to seeing you next year! The condo was perfect. It was tastefully decorated and well stocked for trips to the beach or just hanging out. The owners are very attentive to detail and it shows. We have already re-booked. Thank you for your kind words! We're so happy to have you back! Thank you for taking the time to leave a review! We appreciate it! Lovely little condo on the beach. One suggestion would be to give the check in information in the FIRST email of information. If someone is on the road for a few weeks before, it is easy to miss when multiple emails are sent! Thank you for leaving a review! We hope you return to our "little slice of heaven!" Activities (on site or nearby): biking, golf, tennis, basketball, fitness center, shuffleboard, horseshoes, miniature golf, amusement parks, fishing, wildlife viewing, shopping, restaurants, live theater, cinemas, museums, sightseeing, swimming, snorkeling/diving, boating, sailing, water skiing, surfing, windsurfing, parasailing, jet skiing, shelling.